The newest updates to the Routing & Switching Volume II labs are being released in electronic format starting this week. The updates will automatically show up in your members site account as the labs are released. This Friday the CCIE R&S Lab Meet-Up series kicks off with the new CCIE R&S Lab Workbook Volume 2 Version 5 Lab 1. The new lab will be posted on the members site on Thursday, and the lab meet-up starts at 9am Pacific time. The session should lab about 4 hours, depending on how many questions people have. Essentially I will be configuring and explaining the lab live on the command line, and going through the logic of the solutions in detail. It’s not too late to sign-up for the series, so contact our sales department if you have any questions. I hope to see you there! It looks like IE will be releasing the new labs one lab at a time with a Lab Meet-Up scheduled for each lab to discuss the lab/solutions. UPDATE: That was quick. IE has a blog posting about the new changes here. You can view the recording of the announcement here. 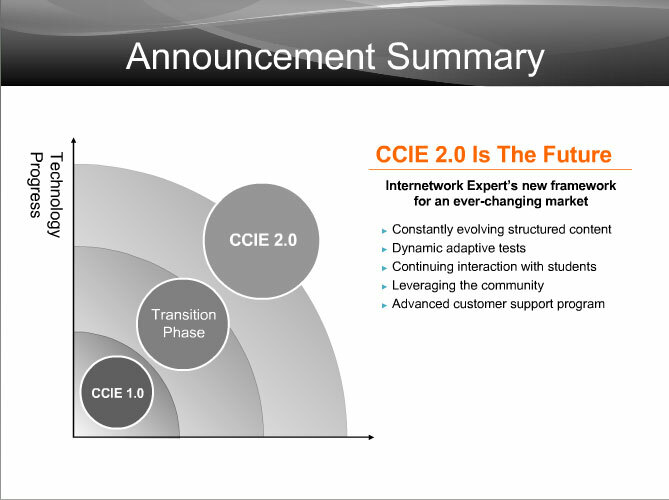 I’ll admit that this is a pretty exciting upgrade to IE’s existing CCIE training. It will be interesting to see how well/quickly they can roll out this new model. The good part is that they have been working towards this for at least nine months and it sounds like they have ramped up their payroll to be able to allocate resources towards this end. Users in VLAN 26 have their default-gateway set to their own IP address instead of r6’s address. Configure r2 and r6 to support them. 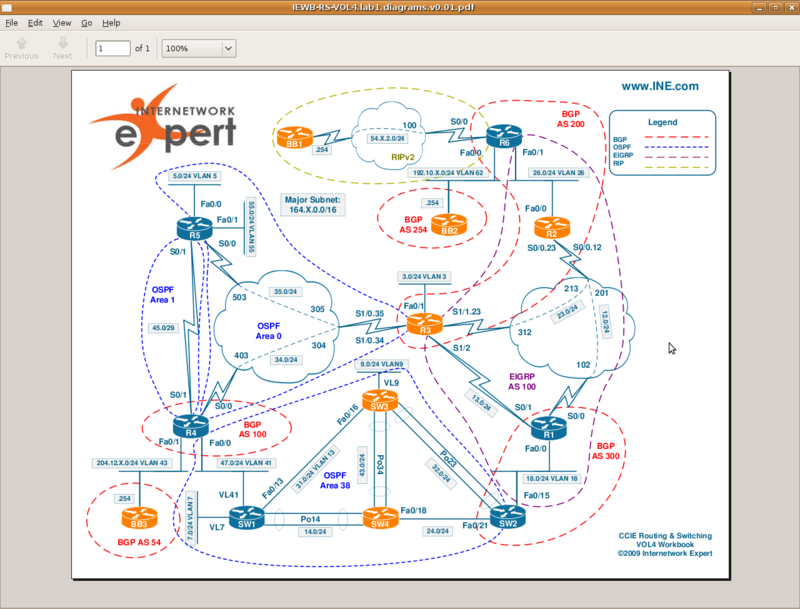 The answer: turn off proxy-arp on those segments. It make sense to disable proxy-arp so as NOT to support these users. The users are set up to ARP for everything. Proxy-ARP is enabled by default so r2 and r6 will respond to ARPs with their own MAC address if they have a route for the address that the users ARP for. By disabling proxy-arp, the routers will not respond to those ARP requests. Configure WCCP for users in VLAN 4. The web servers are out the Frame link. The three options that stand out as possibly being useful for the last requirement are the outbound-acl-check, the group-list, and the redirect-list. I peeked the solution guide. 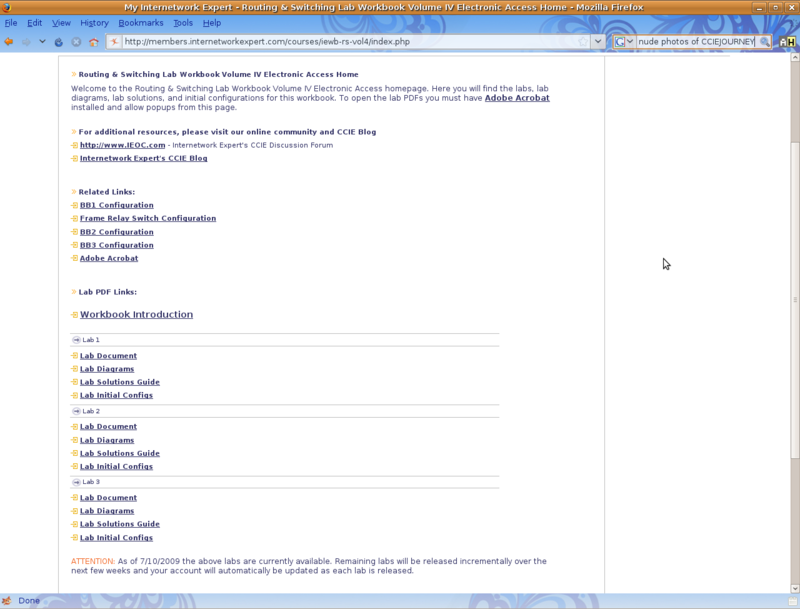 IE just enabled WCCP globally and then set s0/0 to redirect out??? Does that last requirement mean ALL HTTP request on VLANs 4 and 45 or just the traffic between those two VLANs (as I understood it)? I get it now. There are only two egress point for traffic from VLAN 4 or 45. They can either egress the other VLAN or out the Frame link. So IE’s solution makes sense. This is a basic IP SLA task in which you must set up IP SLA on r6 to ping 115.0.0.1 every 30 seconds with 1250 byte packets and a timeout of 25ms. You need to use the SLA monitor in the last task with HSRP. R6 should be VLAN 26’s default gateway but only if the SLA monitor is successful, otherwise they should use r2. In the real lab I would just eat the 3 points rather than mess with connections to the backbone routers. But this task is pretty easy so I gave it a shot. To allow the Cisco IOS software to handle IP datagrams with source routing header options, use the ip source-route command in global configuration mode. Drop all traffic from BB2 to BB3 and vice versa on r5 but do not use any access-lists to do this. We can police inbound, but how to match on the destination without an ACL? Okay, so I can match on the interface, but only the physical interface (which makes sense). IE went with a few less lines of configuration by using a ‘match not’ statement.